Growing herbs is a great way to get started gardening, because herbs are easy and offer so much bang for the buck. 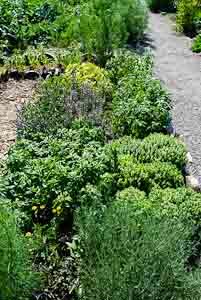 Most herbs require very little space, and they rarely have problems with pests or diseases. The variety of herbs to choose from is astonishing, and they bring such a delightful range of new flavors to the table. A bit of chopped fresh basil, dill or cilantro can transform a worn-out recipe. Fresh herbs are one of the best things you can do to bring "Wow!" to the dinner table. I now grow almost all our herbs, and I have them growing everywhere. Even though Tito and I have a big herb garden right out the kitchen door, I also have herbs mixed in with the vegetables in the main garden, because their small flowers attract beneficial insects which help with pest control, and some are companion plants to the vegetables, like the basil with the tomatoes. It’s great to be able to pop out the back door with scissors at the last minute to harvest something fresh for whatever it is we're cooking. The best herbs to grow are, of course, the ones you love to cook with the most. Seems like a silly answer, but just as with starting vegetable gardening for the first time – begin with what you most love to eat and then branch out and try something new next year. Growing herbs is so easy, you can choose whichever appeal to you most. My personal favorites are basil, parsley, cilantro, rosemary, oregano, thyme, marjoram, chocolate mint (great in coffee) and chives. On that note, many big box stores, especially at Christmastime, sell these little “window herb gardens” which promise that you'll be growing herbs on your kitchen windowsill in no time. Don't waste your money! They come in tiny little pots which you are supposed to just water, and “Voila!” – fresh herbs at your fingertips. But the pots are way too small, and most people don’t have enough sun indoors for them to survive. Start with good healthy starter plants from a proper nursery. All the common culinary herbs are sun-lovers, so unless you have a south-facing bay window or sunroom that gets full sun all day, growing herbs outdoors in an area that gets at least 8 hours of full sun is a much better idea. If you want to grow them in pots or containers read through to the “container herb gardening” section below. 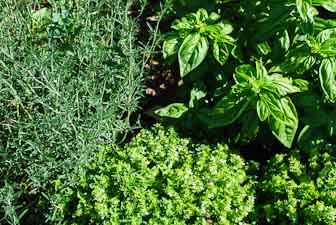 Growing herbs successfully requires well-drained soil without much fertilizer. I am a normally a huge advocate of compost, compost, compost in my vegetable garden. 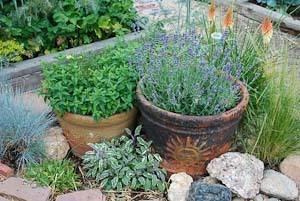 But many herbs, especially the woody perennial ones like sage, rosemary, oregano, thyme and winter savory, don't actually like compost, at least not a lot. And they even seem to prefer being a bit stressed for water. That doesn’t mean to never water them, but most of them do like to dry out a bit between waterings. A lot of the woody perennial herbs originated on the hot, sunny, wild hills of the Mediterranean region or the steppes of Asia, and they have stronger flavor and are less prone to disease if you don't pamper them and respect their wild heritage. But most of the annual herbs like basil, parsley (actually a biennial), and cilantro do better with a bit more compost and more frequent watering. This is why they do well in the regular vegetable garden, whereas we have our woodies off by themselves, where they get less pampering. There is a successful way of growing herbs indoors: the AeroGarden. It has REALLY intense lights and has been designed specifically to provide proper lighting and nutrition for growing herbs indoors - a truly cool indoor herb growing experience. For 3 years I was the customer satisfaction liaison for the company, where I did research and wrote the online help articles, so I can attest to the fact that the AeroGarden really does work. It's also a great way of growing herbs all winter! For annual herbs, Miracle-Gro Moisture Control potting mix works well for moderating moisture levels and providing time-release fertilizer. It also has perlite in it, as well as "water storing crystals". But for perennial herbs I use ordinary (not “moisture control”) potting mix amended with about 10% homemade compost, and some added perlite if it doesn't have much. Remember... the woody perennials have a kind of wild, hardy nature and like to be pretty much left alone. If you want perennials to survive the winter in their pots, you must make sure they are protected from repeated freeze/thaw cycles over the winter. You can bring them into the garage, or bank the containers in a protected corner in late fall and then bury them under bags of dried leaves, or even just make a giant leaf pile right on top of them for protection. They will go dormant and won’t need light until spring, although they may need a bit of water. Also note that unglazed ceramic or terra cotta pots will crack and peel if they freeze with moist soil in them. 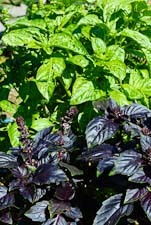 Basil (Ocimum basilicum) is a tender annual that loves sun and heat all day, for 8-10 hours. It has now been bred into dozens of varieties of different colors, scents and flavors. It’s fast growing and easy to start from seed, but don't plant it out until well after the last frost. Basil is the quintessential pesto plant, so if you love pesto, make sure to grow a lot of it. The plants don't get huge, so if you want a lot of pesto, grow a lot of plants. You can help basil grow larger and continue to produce leaves if you keep pinching it back at the top, preventing it from flowering. Also harvest it from the top, not the bottom, to keep it branching and growing. Like most herbs, once it flowers it will lose flavor. It also loses and changes flavor when it's dried, or left to cook. Add it to stews, soups, or pastas at the last minute. I don't fertilize my basil, or any of my herbs really, but basil is one herb that appreciates a good dose of compost in the soil at the time of planting. 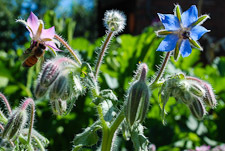 Borage (Borago officinalis) is not a culinary herb, or a particularly tidy herb, but one I love for its bright pink-to-blue star flowers and its power to attract beneficial insects. It's very easy to grow from seed and will reseed itself (whether you want it to or not!) Its edible flowers are gorgeous in salads. When I hung out in herbalist circles, they used to say, "Borage for courage". There is something about borage that makes a garden happy. That sounds terrible anthropomorphic, I know, but subjectively it's true! It's just a crazy happy plant, and it attracts bees like nothing else. Chives (Allium schoenoprasum) is a perennial with best flavor before it flowers. But the flowers are also edible and lovely in salads. It tastes a bit oniony, and goes well diced fresh on top of baked potatoes, pasta or rice. Cilantro and Coriander (Coriandrum sativum) both come from the same plant. The leaves, chopped fresh in Latin and Asian dishes, are cilantro. After it flowers and goes to seed, the ground seeds are known as the spice coriander. It is fast growing and goes to seed quickly, so if you love it, do successive plantings every 2 or 3 weeks throughout the summer and fall. I've read that cilantro can help chelate heavy metals out of the body, but who knows if this is true. It IS true that cilantro contains antioxidants and is anti-inflammatory. People seem to either love or hate cilantro. The aldehydes it contains are similar to those contained in many soaps, and once the brain makes a "non-edible" association with a smell, it can be difficult to dislodge it. I used to hate cilantro, but now I love it! Tito (who's from Chile) makes a scrumptious pesto with it, full of other ingredients like tomatoes, onions, garlic and lemon. Turns out that when crushed, the aldehydes dissipate and the subtler flavors become apparent, which blend nicely with the other ingredients. 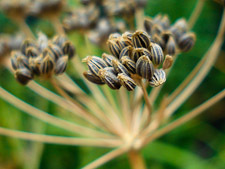 Dill (Anethum graviolens) is another easy-to-grow annual, tall, whispy and delicate. It attracts beneficial insects after it flowers. Garlic (Allium sativum) is a fall-planted bulb. Put it in the ground in October, and plant the largest cloves you can find, individually. Our favorite is roha garlic. Garlic will let you know when it is ready to harvest sometime in June, because the stalks will start to turn yellow and dry up. Dig the bulbs, shake the dirt off, and hang to dry in a cool dark place. Or make a garlic braid! Marjoram (Origanum majorana) belongs to the same genus as oregano, but is a different species. 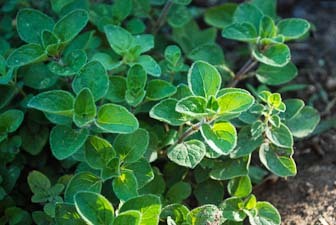 It tastes a bit different than oregano, and the plant tends to be more compact. Its flower buds form little bracts at the top of a stem before they open, which together look a bit like a teeny pine cone. 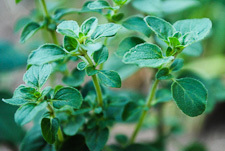 Its growing requirements are the same as oregano: not too much water, no fertilizer, not much compost, and a good mulch with leaves in a harsh winter. Marjoram tastes a bit sweeter and milder than oregano, without oregano's peppery bite. Mint is the easiest growing herb there is... it takes over on its own, if there is dirt and water anywhere around! Oregano (Oreganum vulgare) is actually a genus of plants that contains many species and sub-varieties, hence marjoram, Turkish oregano, Greek oregano, European oregano, Syrian oregano and common oregano. ("Mexican oregano" isn't really oregano, but rather a similar flavored plant from a different genus). Oregano is one of the wild and woody perennials that likes well-drained soil, and not too much compost. It’s most at home when “roughing it”. It tends to grow a little larger and more upright than marjoram, and doesn't do the "teeny pine cone" thing when it's getting ready to flower. 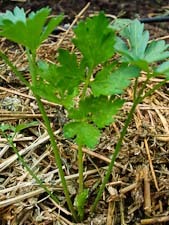 Parsley (Petroselinum hortense) a biennial, which means it lives 2 years and then dies. The first year it germinates and grows leaves, and this is the best time to harvest it. The second year it flowers and goes to seed. Unless you want to save your own seeds, just harvest it through the first year and then pull it out and compost it in the fall, treating it like an annual. Parsley is packed with vitamins and antioxidants, and even though it is not intoxicating like basil is, I eat a lot more of it. It is extremely good for you health-wise, containing significant amounts of vitamins K, C and A. It has anticancer properties, is good for the kidneys, is anti-inflammatory, and is necessary for my favorite salad in the world: quinoa tabbouleh. (Made with quinoa instead of bulgur wheat). I eat so much parsley that I consider it more of vegetable than an herb. I grow parsley from seed, so I usually let one plant overwinter to make seeds for me the next year. Parsley is very slow germinating, sometimes taking three weeks, and it is slow growing at first, so plant it indoors a month or so before last frost. If you eat a lot, plant a lot of plants, because they aren't very big. 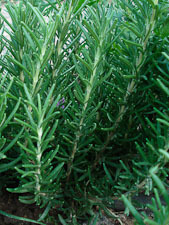 Rosemary (Rosemarinus officinalis) is a woody perennial, which is only really perennial in places with very “mild” winters. When I visited my cousin Charles’ house many years ago in north Wales, they had a rosemary plant by the front door that was 7 feet tall! It did freeze there in the winter, but only a "soft" freeze, maybe high 20s. This winter, cook up a pot of dried large lima beans, add some onions and carrots, and throw in some minced fresh rosemary, from the potted rosemary plant you brought indoors before frost. My aunt Rosemary (in Wales, the one with the giant rosemary plant towering over the front door) fixed me my first bowl of this. It will soothe your bones with the goodness of the earth. Sage (Salvia officinalis) I adore sage, not that I cook with it much, but it is beautiful in full bloom, attracts bees, and does this amazing thing with its leaves. Slowly throughout the fall, the plant pulls juices and nutrients down from its leaves and stores the energy in its roots. The leaves shrivel up, becoming completely crispy and dead, but not falling off the plant. Then a miracle happens in the spring: life very slowly re-enters the dead leaves. Little by little they fill out and eventually are completely gray-green again, growing and bursting with life. It never ceases to amaze me. "Sage" refers to 2 different genus' of plants: Salvia and Artemisia. 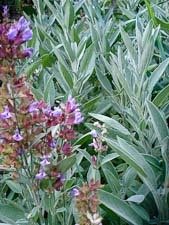 Culinary sage is Salvia, whereas the sage used in most "smudge sticks", as well as the wild kind known as "sagebrush" is Artemisia. 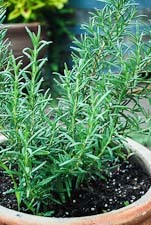 Tarragon (Artemisia dracunculus) is of two kinds: Russian, not so strong, and French, pretty strong. Grow the French for cooking. You have to grow the French kind from starts, because it doesn’t make viable seeds. It also needs 30-60 days of hard freeze in the winter to be happy the next year. Trim it down when it starts to go brown in late summer. 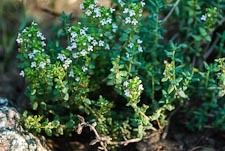 Thyme (Thymus mongolicus) comes in lots of varieties and flavors, from variegated creeping types that will nicely fill the cracks in your flagstone patio, to uprights that are easier to harvest for the kitchen. Though small, it is also one of the woodies, with similar growing requirements to oregano, sage and marjoram. One of my favorite things about growing herbs is how the bees love them. I was a beekeeper for many years (another story), and I still love bees and watching them work. Most of the wild woodies like sage and thyme, as well as mints (and its relatives like nepeta) are extremely loved by bees. As our world becomes less friendly to these wonderful creatures, it’s nice to be able to grow something that really helps them out. So go wild, have fun, and enjoy growing herbs and getting creative with them in the kitchen. Blessings on your basil, borage, and bees!